When I saw the title “23 Signs You’re Secretly An Introvert” in a Huffington Post sidebar, I clicked on it immediately. Just out of curiosity. After all, I’ve known forever that I’m an introvert. A very shy introvert. (And no, shy and introverted are not the same thing.) I certainly don’t need another quickie pop psychology article to tell me about it. Still, I’ve spent a lot of time over the years reading about introversion and personality types, trying to better understand myself. Precisely the sort of thing an introvert would do. What we introverts really need is for more extroverts to read such articles. All too often we are misunderstood by the extroverts in our lives. The article’s title is a classic journalistic hook — a simple, easy-to-read list. 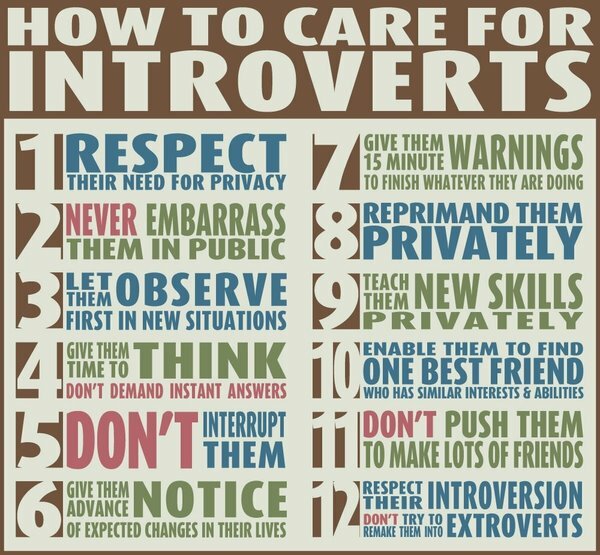 In this case, the list is a quick guide to tell you whether or not you’re an introvert, as if you didn’t already know. I started reading and, not surprisingly, found that many of the 23 signs are the sort of generalities that fortune tellers and mind readers toss out, the sort of generalities that might describe anyone at one time or another. “You’re easily distracted,” for example. The explanations try to clarify, but a lot of casual readers will just skim the bullet points and not read the explanations. I did get a chuckle out of Number 14. “You screen all your calls — even from friends.” I’d thought my approach to phone calls was just a personal eccentricity, but if the author is to be believed, it’s typical of introverts. As recently as 2010, the American Psychiatric Association even considered classifying “introverted personality” as a disorder by listing it in the Diagnostic and Statistical Manual (DSM-5), a manual used to diagnose mental illness. With respect for the profession of psychiatry—the very field that brought us giants like Carl Jung who advanced our understanding of personality—we recommend that the WHO and the APA take a giant leap and stop casting suspicion on behaviors that are natural and normal. Wouldn’t it be fitting at this historic time for these organizations to join the healthy introversion camp by recognizing the more than 150 million Americans who, like Neil Armstrong, simply prefer to exercise their minds rather than their jaws? I missed the HuffPo article you mention. It’s better than the one I saw. I also like that it includes a link to the old Atlantic article from 2003, “Caring for Your Introvert.” That one was something of an epiphany for me, as I’d been unable to explain to a sister why her being shy did not make us alike. She’s always had a million friends, knows everyone in town, etc. She may be shy, but she’s definitely not an introvert. PiedType!!!! Hello friend! We relate! I read that article, too, and I just mentioned being an introvert in something I was writing. Extroverts don’t understand. We love people. We do. But parties and big gatherings wear us out. We need quiet time, time to think. You’re so right. Most extroverts I’ve known just don’t get it. Love the NYT article. If noise is of my own making, it’s fine. But noise I can’t control or get away from makes me crazy. It does exactly what the article says — distracts, impairs concentration, causes the adrenaline to pump, blood pressure to spike, blood vessels to constrict, stress hormones to rise. Employers who dump everyone into “open work environments” are obviously clueless. Hi Bats. Happy you found something worthwhile here. Always something worthwhile on your blog. i recently discovered this about myself and it explains a lot, thought i was an extrovert, but realize now why i need my alone time to regenerate my energy. It helps to understand that you need time alone. It helps even more if and when the extroverts around us understand and give us the space we need. Treasure those who do. I have an Introvert Husband, it is very frustrating at times to deal with him. But that poster you have is good reminder . Thanks for sharing it. Good post, PT. I can relate. I was an introvert until my last year in high school when I became otherwise by sheer will power and the help of a couple of intellectual adults. My wife had a similar experience. But deep down we never actually changed. What does that make us? Beats me. But shyness runs in my genes, in my wife’s and in my children’s. Nature or nurture, always in dynamic tension. It’s the eternal conundrum of self awareness and the puzzle of free will. If free will is not real, it is a process so complex that it is indistinguishable from the real thing. IMHO. As one or more of the articles points out, introverts can and often do act like extroverts. Modern society in general demands it. The modern workplace expects it. But the innate preference or tendency toward introversion never really changes, as you point out. It’s a basic personality type (see Myers-Briggs). It’s a relief to be retired and not have to spend every day pretending to be the extrovert I’m not. Doing so was extremely stressful. It’s an interesting article. I cannot recommend Susan Cain’s Quiet highly enough. Read it once and then read it all again. http://thistimethisspace.com/2012/03/05/quiet-and-societys-extroversion-bias/ For a scientific explanation of an introvert, there is an excerpt from a related book: The Introvert Advantage (How To Thrive in an Extrovert World), by Marti Laney, Psy.D. — Also read Carl King ‘s essay — 10 Myths About Introverts. Thanks. Being an introvert, I’ll likely look into these. On the other hand, I probably do too much navel-gazing as it is. I’ve suspected for some time that the blogging community (or at least the portion that we’re drawn to) self-selects for introverts. It’s a medium that allows for connection without the normal distraction. If you read my page “On Solitude” (http://gusgus64.wordpress.com/memos/), there’s a great quote in there from Anthony Storr (last full paragraph). That’s a wonderful quotation. When I read things like that, I know I would like that person, that I’d enjoy being with that person. We could enjoy things together without having to speak. And yet we’d both understand. They say great artists have eyes set out on the edge of their skulls – they can see more and thus are more observant, so can do art better. I wonder if introverts and shy people don’t have extra sensors in their skin that makes them more aware of other people. I ran across a book in college that was I was in college that was similar to these article – it saved my life. Just to be told shyness was normal. Too many people stick too many labels and shove people into “disorders.” Seriously. I know some do it to get special treatment by schools and such, but if you go with that idea, EVERYONE has something (and actually they do). So the definition of “normal” changes. It really helped me to read some definitive stuff on introversion and understand that not enjoying large groups of people does not mean there’s something wrong with me or that I’m some kind of antisocial wingnut. But I still don’t handle it very well when extroverts fail to understand that. It’s easier to withdraw than to keep taking hits on my self-esteem and self-confidence. so true. Besides who needs the noise. My husband and I were both happy together introverts for years and then he died. Now I am an introvert alone and that has put me more in the spotlight of friends and family because I don’t get out enough and do things they say. I had a similar problem with my family after my 2003 divorce. It’s taken time, but for the most part they now seem to understand that I’m happy alone and that I don’t have to be out and about “doing something” in order to be content. As long as you are happy inside yourself, introversion is fine. When it comes from sadness or fear or feelings of inadequacy, not so much. Aye, there’s the rub. An introvert (me, anyway) keeps looking within, trying to analyze his or her feelings. Picking at them, turning them, examining and reexamining. Am I truly happy alone like this? Or am I alone because I feel inadequate in the presence of others? Spoken like a true introvert! With me it would be a matter of someone else calling me and saying “we should do something together” and me saying “sure … sometime.” I didn’t get that “outgoing” gene. LOL. Wish they’d make those online tests answerable with our mystical magical computers. Seems a crime to still have to pick up a pencil to keep track of our answers. (No, I didn’t bother.) And pat yourself on the back. I’d never heard the word “listicle.” I hope it dies the quick painful death it deserves. LOL. No, I don’t recall ever seeing that. I was influenced mostly by the title of the 1967 best-selling pop psych book, “I’m OK, You’re OK” and secondarily by the image at the end of the post. Amen, PT. I need to turn away and be by myself regularly. The Summer hols are a challenge because it is six weeks without pause or time aone. One feels thin towards the end. It’s always tough for anyone with a busy family to find “me time.” I used to have the same problem, although the fall and winter social seasons seemed worse than the summers. Thank you for reminding me that I have an introverted Son and that’s just “how he rolls”. Ah, my son is an introvert too. Probably why we get along so well now despite the inevitable bumps when he was growing up. I’m glad that you get along well! I wish that I could say that about our relationship…my son is so far away and usually exhausted on the weekends when we get a chance to talk..so of course he doesn’t open up much. I’ve always tested either INFJ or INTJ. That perfectly reflects my lifelong decision-making dilemma — whether to follow my heart (F) or my head (T). And I agree about the mountains. Nobody there to yap in your ear and spoil the serenity — and yet the mountains speak to us constantly. One has but to listen. Another reader has reported trouble when trying to post comments. He gets the message “Sorry, this comment could not be posted.” Is that what happens to you? And you aren’t alone with that image problem. Several other readers and yours truly have also failed to embed images in comments. So it worked this time? 🙂 I never use my phone for online stuff, so I’m clueless what the problem might be.